Portable Antiquity Collecting and Heritage Issues: Diligence? What diligence? 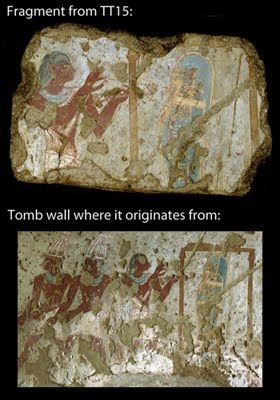 A few days ago discussing the Theban Tomb 15 fresco fragment that turned up in the Louvre, I said I could not find a picture. Now I have, on Heritage Key which may in turn have derived from Zahi Hawass' blog - and I must say I am shocked. Well firstly on seeing it, it seems to me pretty obvious that on being offered a bit of fresco like the bit the Louvre bought, it seems to shout out "Thebes, early New Kingdom". Any due diligence search should have looked at published Theban tombs, should have involved the regional inspectors. Did they? So why was this fragment of a scene not almost identified for what it was by the "experts" at the Louvre? Why after its purchase was it not recognised for what it was and returned without having to be asked? Secondly what on earth did these people think they were doing? What kind of "art" were they displaying? This cut out piece shows nothing, means nothing taken out of the context of the whole scene (including the dancers to the left). It is a shallow vestige, a mere trophy, not a document. It is a piece of wall of a structure brutally turned into a "portable" antiquity. It is obvious that the person getting it out bungled the job, presumably meant to take more, but the edges crumbled - in other words large areas of the fresco are destroyed already, just so some collector could have a trophy and eventually sell it on - no doubt at a hefty profit over what he paid the smugglers and his business partners. What does this fragment in a museum tell the viewer that a large scale high fidelity reproduction of the whole scene cannot? Why do museums still buy such items? The money the Louvre paid for this hacked out bit of what was once a work of art as well as precious evidence of the past, could just as well (and much more usefully) have been paid into a fund to conserve paintings like these in situ - but then even though the remains of the past would be preserved the Museum would not have its trophies. I think the French government should now be invited to take patronage over TT15, do a proper conservation job and perhaps restoration, and then find a way of making this tomb more secure from further attacks, but also allow its opening to the public and bear all the costs. If they want to "preserve the past", fine. Let them actually do it and not add to the destruction by financing it. Photo: "Vestiges of ancient art", decoupage by "Looter". "Harpies of Cultural Property Nationalism"
Two wrongs make a Right for collector?